As means of purification and self discipline, stretches way back in time. Yogis mainly will fast to bring the mind and senses under control, but also to cleanse and thus rejuvenates the body. Infact fasting is the body`s natural way of dealing with illness or pain – animals in the wild will stop eating when hurt or unwell and we ourself lose our appetites if we are feverish. In normal life, much of our energy is devoted to the process of digestion. Resting the digestive system once a week releases this energy for allowing the body to rid itself of toxins and allow our organs to repair and relax. You would have heard about the “Sevvai Kilamai Viratham”(Tuesday fast) in Hinduism practices. This is because Sevvai(Mars Planet) is the original planetary ruler of the body. Energy that eminate from this planet can heal and repair our organs. This planet will release its energy highly on Tuesday. 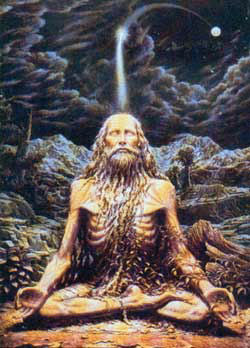 Thus, Tuesday is designed as the fasting day by the Indian mystics to allow our organs to repair and relax. Do you know that the most sensitive organ in our system is the intestine. If not taken care properly this organ can cause malfunction and can affect your whole system. Every Tuesday start the day with light breakfast which can be easily digest. Drinking water would do no harm to your fast. It actually helps in the cleansing of your body. For initial starters, please be reminded that it is not advisable to go without food the whole day. This is because many of us are subjected to working conditions that involve frequent travel and high level of stress. Thus, fasting completely would only deteriorate one`s health.For those who are unable to go on a complete fast, you can have milk and fruits as your diet every Tuesday(avoid acidic fruits like apple and orange). You can have your own dietary pattern when you are fasting. The whole idea is to allow the organs to relax so that they can work better for the rest of the week. Fasting every Tuesday without fail will keep your body in balance and ultimately improve your bowel movement. This would eventually allow the organs to function effectively. Perhaps the most difficult part of a fast is breaking it sensibly, for as soon as you taste you’re your mind will demand that you eat and eat. After fasting you must reaccustom your body gradually to eating, choosing your first food with care. Break your fast in the evening and do not eat again until this food has gone through the system(3 hours). Start with sweet fruits follow by easily digestive food. According to scientific research, it is known that the air pressure on the earth varies to extreme limits on both the new moon (Amavasya) and the full moon (Purnima) day. This is because of the orbital path combination of the sun, moon and earth. 2) Another explanation for 11th thiti fasting is that compared to any other day of the moon cycle, atmospheric pressure is lowest on 11th tithi days. Thus, this is the best time to fast and cleanse the bowel system. If we fast on any other day (except on Tuesday), the high pressure/strain may damage our system.